What Is the Difference between Ultherapy and Laser Skin Tightening? There are many new technologies now being used to tighten the skin including Ultherapy and Laser Skin Tightening. To determine what is best for you, it is important to understand your concerns and goals. Some people have fine lines and wrinkles while others have heavy sagging and deeper wrinkles. These signs of aging are caused by changes in various layers of the skin. Once you know what your concerns are, they can be addressed with the appropriate type of treatment directed at the specific layer of the skin where the changes are. Laser Skin Tightening addresses the surface layers of the skin while Ultherapy targets the deeper layers of the skin. In addition, there are other treatments such as Botox, Juvederm, and Voluma which can address certain other wrinkles. 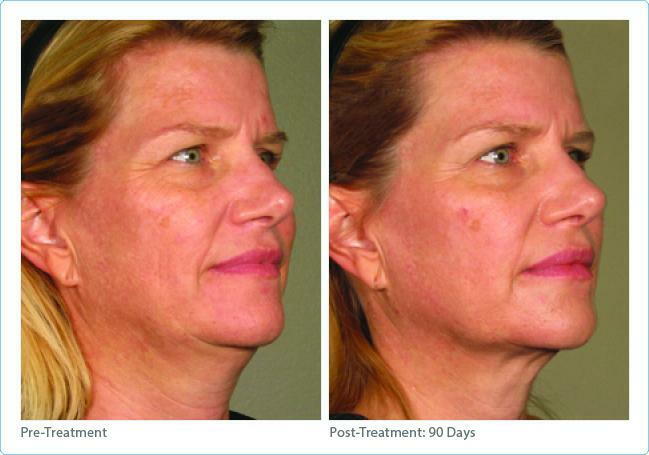 Ultherapy is a new non-invasive facelift alternative that uses the power of ultrasound. The ultrasound energy is precisely focused, targeted, and delivered to the deep layers of the skin (called SMAS). Over time the collagen in these deep layers of the skin is lost and the skin becomes loose and saggy. The effects are deeper wrinkles, loss of jawline definition, and appearance of jowls. Ultherapy targets these deeper skin layers to tighten the skin, which are the exact layers that are treated with a surgical facelift. But instead of cutting and putting a surgical bandage over it, Ultherapy allows your body's natural healing process to form new, fresh, and healthy collagen to tighten up the skin. With Ultherapy usually only one treatment is needed and results are seen slowly over three to six months. What Does Laser Skin Tightening Treat? Laser Skin Tightening uses infrared light instead of ultrasound energy. Some other modalities such as Thermage, Accent (Alma), 3DEEP (EndyMed), Venus Freeze, Viora, and Exilis. use radiofrequency. The idea is that the infrared light or radiofrequency energy will heat up the surface layers of the skin. Laser Skin Tightening uses gentle micro-pulses of energy to stimulate collagen formation in the surface layers of the skin. The surface layers of the skin are the areas most affected by the sun. Sun damage causes many changes in the skin including fine lines, wrinkles, dark spots, and broken capillaries. Laser Skin Tighteningaddresses these changes in the surface layer. Unlike Ultherapy, Laser Skin Tightening requires a series of four to six treatments which are done every two weeks. After that, maintenance treatments are done every three months to preserve your results. As with Ultherapy, results with Laser Skin Tightening are seen slowly over three to six months. Botox is a purified protein used to address certain wrinkles on the skin associated with facial expressions.Unlike Ultherapy, Laser Skin Tightening, Juvederm, Restylane, Radiesse, or Voluma, which address wrinkles seen at rest, Botox (as well as Dysport and Xeomin) addresses wrinkles that form with or are exagerrated by facial expression. These wrinkles include the horizontal lines on the forehead seen when you raise your eyebrows, the vertical lines between the brows seen when you frown, and the crow's feet around the eyes seen when you smile or squint. Often times Botox is used in combination with Ultherapy and Laser Skin Tightening for full facial rejuvenation. Dr. Alex recommends Botoxtreatments to be done approximately two weeks before an Ultherapy treatment or series of Laser Skin Tightening treatments. This allows the muscles to relax so that the collagen in the skin can form without resistance from muscle movement. Botox results are seen as early as three to seven days, but could take up to two weeks and most people enjoy the results of their Botox treatment for three to four months. What Do Juvederm and Voluma Treat? Juvederm and Voluma are dermal fillers that address signs of aging associated with volume loss. Over time we lose volume in the face in various areas. This volume loss causes the face to sink and apppear older. Voluma targets the volume loss in the upper cheeks to give your face an instant lift. Juvederm, on the other hand, is injected directly into the smile lines and marionette lines that appear in the lower face. This addresses the result of the aging process, while Voluma addresses the cause. Therefore, Dr. Alex recommends a combination approach starting with Voluma to address the cause of the change (volume loss). After a few weeks, the skin is re-assessed to see if you can benefit further by adding Juvederm. Results with Juvederm and Voluma can be seen right away, although there can be some swelling which subsides in two to four weeks. Most people enjoy the results of their Juvederm treatment for up to 15 months (with optimal treatment) and Voluma for up to two years (with optimal treatment). Combining Juvederm and Voluma with Ultherapy or Laser Skin Tightening as well as Botox allows for a comprehensive approach to rejuvenating your face.